Whether you are an executive or sales manager in a networking company, a data communications engineer, or a telecommunications professional, you must have a thorough working knowledge of the ever growing and interrelated array of telecom and data communications technologies. From protocols and operation of the Internet (IP, TCP, HTTP, ...) and its access systems such as ADSL, and GSM... to the basics of transmission and switching, this newly revised resource delivers an up-to-date introduction to a broad range of networking technologies, clearly explaining the networking essentials you need to know to be a successful networking professional. Moreover, the book explores the future developments in optical, wireless and digital broadcast communications.This second edition has been thoroughly updated to cover recent market and technological advances that are bringing about the integration of telecom networks and the Internet. It provides the latest on such cutting-edge technologies as dense wave division multiplexing (DWDM), wireless local area networks (WLANs), and GPRS and Bluetooth. What's more, the book offers a clear explanation of the operation of each Internet protocol. 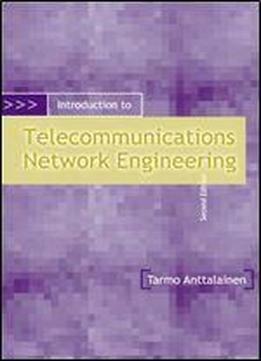 In addition to being an all-in-one reference for networking professionals ranging from sales managers to network engineers, this book is a suitable introduction for students of telecommunications and data communications networking.